Throughout human history, the overall pattern of intergenerational transfers has been clear. Transfers from adults to children are substantial. Not that long ago, transfers to the elderly were quite low, because people tended to work until they died, at which point many of them left bequests to the next generation. Even in more recent times,when social programs began to create transfers from working-age adults to the elderly, the combination of support for those who are younger when alive and bequests after death meant that the overall pattern of intergenerational transfers went from older to younger. But with the relatively smaller number of children in many countries, the relatively larger of elderly, and the growing costs of government programs to support the elderly, the fundamental historical pattern of transferring assets from older to younger generations seems to have flip-flopped in several countries--with more on the way. Ronald D. Lee and Andrew Mason tell the story in "Generational Economics in a Changing World," which appeared in Population and Development Review, January 2011 (supplementary issue), pp. 115-142. Many in academia will have access to the journal through library subscriptions, but the article is not freely available on-line. They draw upon the work of 23 country teams participating in the National Transfer Accounts project. For an overview of this project, a useful starting point is the 2011 book edited by Lee and Mason called Population Aging and the Generational Economy: A Global Perspective. The book has 32 chapters by about 50 economists and demographers. The fundamentals of the generational flip-flop story can be told through a figure that shows patterns of income and consumption over the life cycle. Each figure has refers to three sets of societies: "hunter-gatherers," based on data from anthropological studies; poor countries, which is based on data from Kenya, Indonesia, Philippines, and India; and rich countries, based on data from Japan, the United States, Sweden and Finland. The first figure shows age on the horizontal axis. The vertical axis is the number expressed as ratio to average labor income for those in the 30-49 age bracket. The dashed lines show income; the solid lines show consumption. First consider income and consumption for children. For all three kinds of societies, the "income" lines are essentially zero for those under age 15 or so, who don't produce much. The consumption lines for children rise from about .3 of an adult's labor income at birth to .4 by teenage years. Consumption of children is notably higher in the rich countries. Then consider the income-earning years. Remember that the vertical axis is scaled as the ratio of average income for someone in the age 30-49 age bracket, so it's no surprise that all three of the income-earning lines rise to be equal to roughly 1 for that age interval. 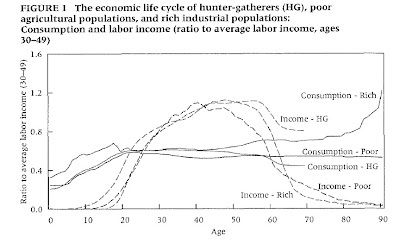 However, it's interesting to note that peak income-earning drops off sharply first in the hunter-gatherer countries, and then then a few years later in the poor countries, and then a few years after that (just after age 60) in the rich countries. In all three of these types of societies, consumption during peak income-earning years is about .6 of typical adult's income; after all, a substantial chunk of that income is going to support children at this time. Now look at the older age brackets. 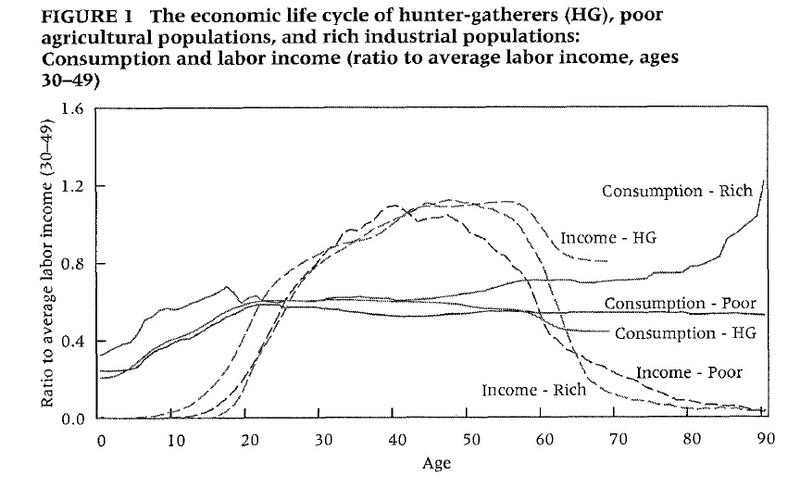 Note that on average, even at age 70, the hunter-gatherers have income well above consumption. In those societies, transfers from older to younger generations continue pretty much up to death. For poor societies, income drops below consumption at about age 60, but consumption stays more-or-less flat to the end of life. For the rich societies, income drops below consumption about age 65. At that point, income in rich countries keeps falling sharply, dropping below the level for poor countries by the late 60s. Moreover, consumption of the elderly in rich countries is not flat, but instead is rising; indeed, consumption levels of the elderly as a share of the income of a working adult are higher than at any earlier point in life! Looking at a broader group of countries, Lee and Mason state: "We show that the direction of intergenerational transfers in the population has shifted from downward to upward, at least in a few leading rich nations." In particular, they look across countries and present calculations of the average age at which income is earned, and the average age at which consumption happens. For example, in the United States the average age for earning $1 of income is 43.4 years, while the average age for $1 of consumption is 41.3 years. Thus, the U.S. maintains the traditional pattern of overall transfers from older to younger. As you might expect, this pattern of older-to-younger transfers is more extreme in low income countries. For example: In India, the average age of income is 39.5 years, and the average age of consumption is 30 years. In Kenya, the average age of income is 35.7 years, and the average age of consumption is 23.9 years. But in a few countries, the classic pattern that has lasted throughout human history has now been reversed. In Japan, the average age of income is 45 years, while the average age of consumption is 45.8 years. In Germany, the average age of income is 42.2 years and the average age of consumption is 44.9 years. There is nothing inherently unsustainable about societies in which flows of funds, as a whole, are transferred from younger to older generations. In the narrow programmatic sense, it is true in many countries that that the current promises of payments to the elderly do not have sufficient funding in the existing programs, and so the facts of accounting will at some point force these programs to evolve. But in a broader sense, a younger-to-older society will need to run on a set of social expectations and arrangements that are different from any previous society in human history, and will involve social, political, and institutional changes that I think we are only dimly beginning to discern.